1) PARTICIPATION CONSTITUTES ENTRANT’S FULL AND UNCONDITIONAL AGREEMENT TO AND ACCEPTANCE OF THESE OFFICIAL RULES. The #SPARKSOMEFUN with Sea-Doo & deadmau5 Sweepstakes (hereinafter referred to as the “Sweepstakes”) is for a limited time and begins on March 14, 2014 at 9:00 am ET through March 22, 2014, 11:59:59 pm ET. (the “Sweepstakes Period”). The Sweepstakes is sponsored by Bombardier Recreational Products Inc. (“BRP” or the “Sponsor”), 565, de la Montagne, Valcourt, Quebec, J0E 2L0. 3) NO PURCHASE NECESSARY TO ENTER OR WIN. A PURCHASE WILL NOT INCREASE YOUR CHANCES OF WINNING. 4) ELIGIBILITY: This Sweepstakes is open to legal residents of Canada and the United States (excluding Puerto Rico and Québec) who have reached the age of majority in their states/provinces of residence as of the date the Sweepstakes begins, and have a valid Twitter, Instagram, Facebook, or Vine account and a valid email address. Employees of BRP, their subsidiaries, affiliates and advertising/promotional agencies, their immediate families (spouse, parents, children, siblings and their spouses) and individuals living in the same household as such employees are ineligible. This Sweepstakes is governed by the laws of Canada and subject to all applicable federal and provincial laws and regulations. VOID WHERE PROHIBITED BY LAW. 5) PRIZES: A total of 250 draws, each for a chance to win two (2) tickets to the private deadmau5 concert on March 23, 2014 at Fontainebleau Miami Beach, Miami Beach, Florida. a) Facebook: During the Sweepstakes Period, an eligible individual (“Entrant”) may enter the Sweepstakes by logging on to Facebook and visiting http://www.facebook.com/seadoo (the “Page”) or go directly to www.sparksomefun.com. If the Entrant does not already “Like” the Sweepstakes Page, the Entrant must “Like” the Page before registering. i) Photo submission: To enter a photo into the contest, photo must include a picture from the daily events leading up to the deadmau5 concert in Miami, FL, from March 14-22, and include the hashtag #SPARKSOMEFUN. These activities will be promoted 24 hours before each event on the Sea-Doo social pages (Facebook, Twitter and Instagram). Once a photo is posted the entrant will receive one (1) sweepstakes entry. We recommend that the entry is tagged with the hashtag “#SPARKSOMEFUN” but this is not a condition to entering this portion of contest. ii) An Entrant must register by completing all of the requested information, including valid e-mail address (“Address”), his/her first and complete last name (no initials), Zip Code/Postal Code and phone number. iii) Before completing registration, the Entrant must accept and agree to the rules. b) Twitter, Instagram, and Vine: During the Sweepstakes Period, an eligible individual (“Entrant”) may enter the Sweepstakes by posting a picture, video or text tweet, posting a video or image on Instagram and tag the post with the hashtag “SPARKSOMEFUN”. The photo, video, or text tweet or Instagram image must be taken at the daily events leading up to the deadmau5 concert in Miami, FL, from March 14-22. These activities will be promoted 24 hours before each event on the Sea-Doo social pages (Facebook, Twitter and Instagram). Within a few hours, the participant will receive a message on the method of entry with a bit.ly link that thanks them for signing up and they then must click on the link or cut and paste it into a browser to complete their entry into the sweepstakes. i) An Entrant must register by completing all of the requested information, including valid e-mail address (“Address”), his/her first and complete last name (no initials), Zip Code/Postal Code and phone number. ii) Upon completing registration, the Entrant will receive one (1) entry into the Sweepstakes Pool. c) Entries must be the original work of the Entrant; must not infringe any third party’s rights; must be suitable for publication; must not contain obscene or pornographic material; may not contain defamatory statements; may not invade privacy or other rights of any person, firm, or entity; may not in any other way violate applicable laws and regulations; may not contain reference to any third party trademarks, names, or third party logos; and may not contain any copyrighted works owned by third parties. Entries containing prohibited or inappropriate content as determined by the Sponsor in its sole and absolute discretion will be disqualified. d) Submission of an entry grants Sponsor, Epicfail, Inc., Joel Zimmerman, and their respective agents and designees the unconditional right to publish, edit, adapt, edit, and/or modify such entry in any way, in any and all media, without limitation, and without consideration to the Entrant, whether or not such Entrant is a winner of the Sweepstakes. BY SUBMITTING THE ORIGINAL PHOTO, VIDEO, OR TWEET, THE ENTRANT REPRESENTS AND WARRANTS THAT HE/SHE HAS ALL RIGHT, TITILE, AND INTEREST NECESSARY TO GRANT THE SPONSOR, EPICFAIL, INC., AND/OR JOEL ZIMMERMAN THE UNRESTRICTED RIGHT AND LICENSE TO POST THE ORIGINAL PHOTO, VIDEO, OR TWEET ON THE INTERNET OR USE THE ORIGINAL PHOTO, VIDEO, OR TWEET IN ANY OTHER WAY. e) Entrant hereby agrees to license to Sponsor, Epicfail, Inc. and Joel Zimmerman, on an exclusive, transferrable, royalty-free basis extending worldwide in perpetuity, the right to exploit any and all entries, in all manner and media now known or hereafter devised, including, without limitation, the use (for commercial or promotional purposes) in phonograph record albums, merchandise, motion pictures, television, live performances, via Internet/multimedia and website, via mobile telephones, videocassettes/DVDs, all audio-visual rights, publishing rights (in all forms, including, without limitation book publishing in either physical or digital format) and publication rights for publicity or advertising purposes. f) Winners will be drawn each night and will be notified by email within 24 hours. Upon notification, winners can download and print their tickets for entry into the concert. g) The third party application provider, Offerpop, will monitor all entries and will tally all applicable entries. h) Only one Entry per person/per account (regardless of whether one person has more than one social media account or more than one person uses the same Facebook, Vine, Twitter or Instagram Account). It is solely the Entrant’s responsibility to notify Sponsor in writing if his/her account(s) change. 7) SELECTION OF WINNER AND PRIZE CLAIM: Draw will be held daily from March 15, 2014 through March 22, 2014 at the Look Marketing offices, 203 E. Melbourne Ave., Melbourne, FL 32901, or the Fontainebleau Hotel, 4441 Collins Avenue, Miami Beach, FL, 33140. Winners are randomly selected. Odds of winning depend on number of entries received. 8) Decisions of the Sponsor in the selection and determination of winners and all matters relating to this Sweepstakes are final and binding. The Sponsor will email winners a link to download tickets and print at home within 24 hours the date of the prize draw. If the Sponsor is not able to make contact via email with a potential winner within the allotted time, using the email address that the potential winner has provided, then at the sole and absolute discretion of the Sponsor, that Entrant may be disqualified, and his/her entitlement to receive the prize may be forfeited, and the Sponsor reserves the right to randomly select another potential winner, whom the Sponsor will attempt to contact. 10) These rules are published on the Sea-Doo Offerpop Facebook application and the Sea-Doo OnBoard Blog. 11) By accepting the prize, participant consents to the use of his/her name, photograph, image, voice, and statements related to the Sweepstakes, for marketing, advertising, and promotional purposes, without further compensation. There are no transfers, substitution and prize is non-refundable. No cash alternatives for any prize, except at the option of the Sponsor, who may substitute a prize of equal or greater value if advertised prize becomes unavailable. 13) Only the number of prizes stated in the Official Rules will be awarded. This Sweepstakes is subject to all applicable federal, state, provincial and municipal laws and regulations and is void where prohibited by law. 14) Entries generated by script, macro or other automated [or mechanical] means or means which subvert the entry process will be void. All entries become the property of Sponsor and will not be acknowledged or returned. 15) This Sweepstakes is in no way sponsored, endorsed or administered by, or associated with, Facebook, Twitter, Instagram, or Vine. Participants are providing their information to Sponsor and not to Facebook, Twitter, Instagram, or Vine. The information provided will only be used as stated in the Sweepstakes Rules. Facebook, Twitter, Instagram, and Vine are completely released of all liability by each Entrant (and, if the entrant is at least 18 but under the age of majority in his/her /state/territory of residence, his/her parent or legal guardian) for this Sweepstakes. Any questions, comments or complaints regarding the Sweepstakes must be directed to the Sponsor. 16) Sponsor is not responsible for lost, late, damaged, misdirected, defaced, mutilated, illegible, incomplete, or altered prize claims or other entries or matters pertinent to this Sweepstakes. Winners are randomly selected. The Sponsor is not responsible for printing, distribution or production errors or errors by mechanical readers or for lost, late, or misdirected entries. In the event that production, seeding, printing or other errors cause more than the stated number of prizes of any category to be claimed, Sponsor reserves the right to retract such excess prizes. 17) By entering this Sweepstakes, the Entrant acknowledges and agrees that Bombardier Recreational Products Inc., BRP US Inc., Epicfail, Inc., Joel Zimmerman, their affiliates and their respective officers, directors, employees, dealers, agents, representatives, successors, and assigns and insurers (collectively, “the Released Parties”) (i) shall have no liability of any kind whatsoever with respect to this Sweepstakes and/or the awarding or use of the Prizes, (ii) make no warranty, guaranty or representation of any kind concerning the Prizes, (iii) disclaim any implied warranty of merchantability or fitness for any purpose, and (iv) are not liable for injury, accident, loss or damage of any kind resulting from the acceptance, conveyance or use of the Prizes or from participating in this Sweepstakes. The Release Parties are not responsible for typographical errors or any other errors in the offer or administration of this Sweepstakes, including but not limited to errors in the advertising, the Official Rules, the selection and announcement of winners, or the distribution of the Prizes. Entrant hereby agrees to indemnify, defend and hold the Released Parties harmless from any and all claims, causes of action, demands, damages, losses, costs, obligations, recoveries and deficiencies (including attorney’s fees and costs) which arise from or relate in any manner in whole or in part, to (i) any of the representations or warranties of Entrant hereunder; or (ii) the Released Parties’ use or other exploitation of the applicable Entrant’s entry. PORT: Richards Bay South Africa. Currently living in Phoenix, Ariz. OnBoard – Where did you grow up and how was your competitive spirit developed? I grew up in Empangeni South Africa. I was always competitive and started racing when I was 12 years old. My father was a powerboat racer and we own a boat building company in South Africa, so I have always been around the water. OnBoard – What do you do away from the water to stay on the water? What’s your profession? I am a partner at Kommander Industries here in Phoenix, Ariz. It is one of the top performance PWC shops in the world. I also own FAST POWERSPORTS in South Africa and we are one of the leading Sea-Doo dealerships in the country. Being involved in my dealership back home and working here in the US to grow Kommander, I am able to stay involved in the industry at all times and it’s a great life to live. OnBoard – How were you introduced to watersports? The family boat building factory gave me plenty of time growing up to be around the water. This is where I found my love for PWC and the industry. OnBoard – Since you began racing what are some of your most memorable accomplishments? OnBoard – Where is your favorite PWC riding location? I love riding and training in Lake Havasu, Ariz., but the ultimate is riding in the surf in South Africa. The water is warm and clean and I get to ride with my brother who also is another top racer not only in South Africa but the U.S. as well. OnBoard – What is it about PWC riding that keeps you coming back? It just never gets boring. The conditions are always changing and you have to adapt to change at all times to compete at this level. Also, with the new age and generation of watercraft available, the speed and performance keep me wanting more everyday. I have always wanted to race the Sea-Doo RXT-X in a big endurance race and we finally have the opportunity. The RXT-X is very fast and stable and is a great platform to start with off the showroom floor. I partnered up with pro runabout world champion Jared Moore and, with his knowledge of the Rotax 4-Tec power plant, I expect we will get the very best out of the RXTX. With Kommander Industries and assistance from Sea-Doo Centre, we are able to get the best parts available for our RXT-X as we prepare for the Mark Hahn 300. For this race Jared and I will be changing the valve springs and retainers to allow for a higher rev limiter, Aftermarket programmable ECU and a few handling mods as well. The RXT-X is a great craft straight off the showroom floor, so we want to prove it does not take many modifications to make the already fast stock RXT-X a race proven winner. OnBoard –You are now living in the United States, what races do you intend to race with your RXTX and who is helping with your racing efforts. The plan at this point is to hit as many of the endurance races as possible this season. I love riding my RXT-X so I am looking for every excuse to go to the races. The great sponsors who stand behind me as I go out to add many more titles to my collection for the 2014 season make all of this possible. Thank you Kommander Ind., Fast Powersports, Rockstar, Sea-Doo Centre, Burn Industries, Villon Clothing, Jettrim, Airoh helmets and the Sea-Doo X-team. BRP is collaborating with groundbreaking electronic artist deadmau5 to launch its latest product, the 2014 Sea-Doo Spark personal watercraft (PWC), with a live concert event. “Spark Some Fun Miami” with deadmau5 will be held at Fontainebleau Miami Beach on Sunday, March 23, and will showcase the spirit, fun and ingenuity behind the Spark model through a lively and colorful musical exhibition. To kick off the partnership, fans are invited to enter to win a 2014 Sea-Doo Spark paired with a Move I Trailer and a trip for two to an exclusive “Spark Some Fun Miami” deadmau5 concert at the Fontainebleau Miami Beach. This sweepstakes is referral based, fans enter to win the contest simply by completing an entry form and can increase their chances of winning by up to 10x by referring family and friends. Each family or friend referral who signs up for the sweepstakes counts as an additional contest entry with a maximum of ten. Five lucky fans will win the Sea-Doo Spark and trip package to “Spark Some Fun Miami.” Enter to win by visiting www.sparksomefun.com or the direct sweepstakes link. For 500 lucky fans, “Spark Some Fun Miami” featuring deadmau5 will be a once-in-a-lifetime, free concert experience. From March 14-22, anyone can post a photo to Instagram or Twitter with the hashtag #SparkSomeFun and follow the prompt to enter to win a pair of tickets to the show. Or entrants can go directly to sparksomefun.com to enter. For deadmau5, the partnership is an ideal fit. The Toronto native and critically acclaimed producer has always had a passion for recreational watersports. It was the brand’s industry leadership, innovative engineering and imaginative design that drew him to this unique collaboration. 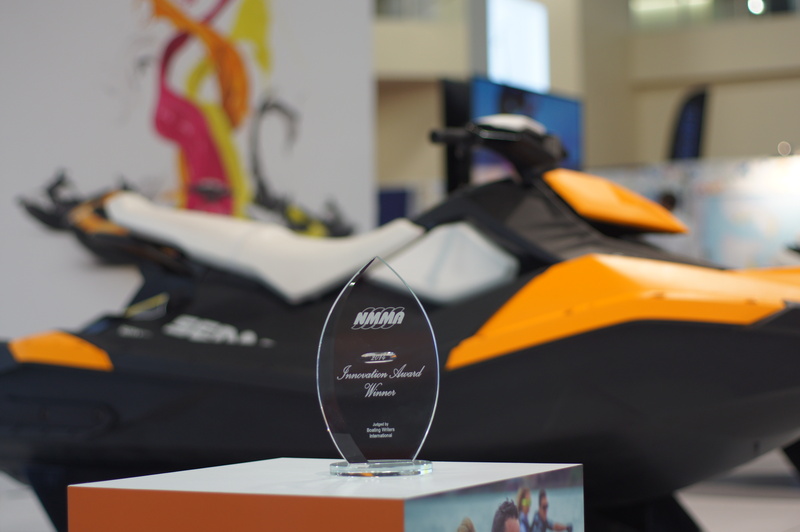 Winner of the 2014 NMMA Innovation award, BRP continues its legacy of revolutionizing the watercraft industry with the most accessible PWC on the market: the Sea-Doo Spark. Starting at just US $4,999, five eye-catching colors and over 20 custom Attitude Graphic Kits make each Spark distinctive and tailored to its rider’s personal style. Deadmau5 fans and Sea-Doo enthusiasts alike have the opportunity to test ride the new Sea-Doo Spark. For more information visit tryaseadoo.com. 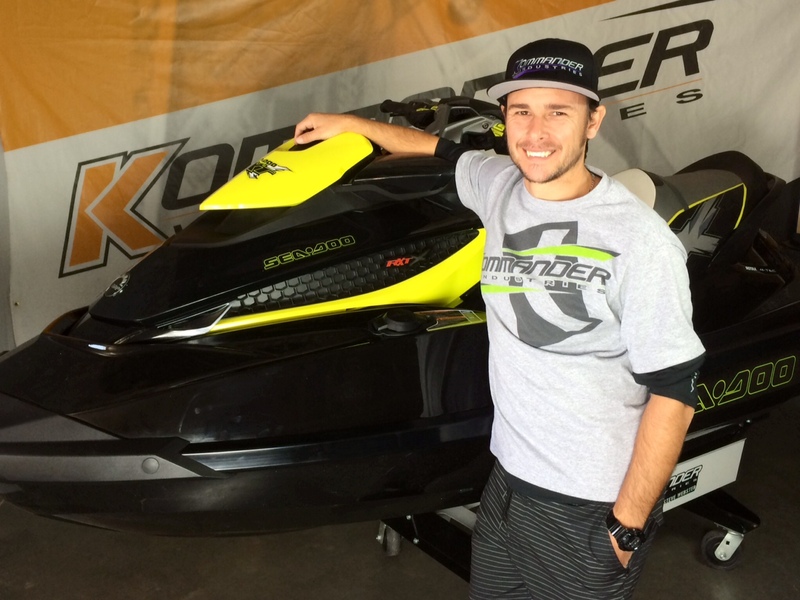 BRP WINS INNOVATION AWARD WITH GAME-CHANGING SEA-DOO SPARK WATERCRAFT. Miami, FL, February 13, 2014 – BRP’s Sea-Doo Spark watercraft adds a sixth National Marine Manufacturers Association (NMMA) Innovation Award in six years to the company’s collection of marine industry accolades. 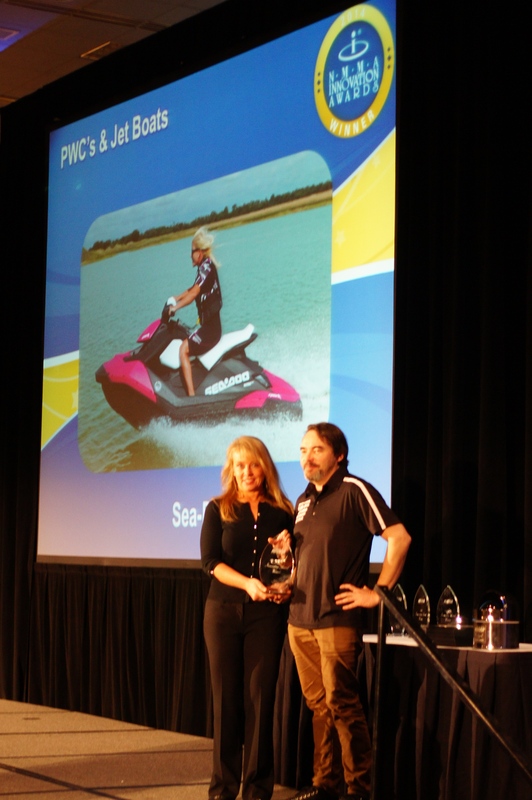 NMMA Innovation Award judges noted, “The Sea-Doo Spark is expanding the entry level of boating. At half the weight and half the price, you can still have all the fun on the water. “ Hours after my ride I could still taste the adrenaline,” said Ann Dermody, member of the judging panel. 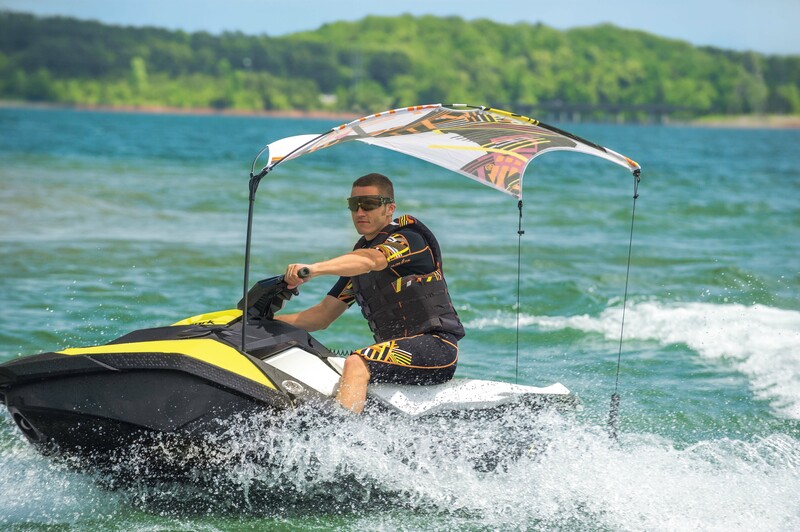 The Sea-Doo Spark watercraft features a nimble and compact design thanks to an all-new Exoskel architecture and the use of a new, lightweight, durable and recyclable Polytec material. The mould-injected process allowed BRP designers to implement new concepts in the area of shape and structure leading to a unique look and offering an equally refreshing way to play on the water. The most accessible new watercraft on the market, the 2014 Sea-Doo Spark PWC, costs nearly 40% less than its closest competitive model* and is the most fuel-efficient watercraft in the industry**. For a more in-depth look at how the new Sea-Doo Spark makes the dream of family fun on the water possible now visit the Spark page. BRP Director of Advanced Concepts, Andre Cote, accepts the 2014 NMMA Innovation award at the Miami Boat Show. Sea-Doo Shopping has never been easier! Welcome to the new Sea-Doo online store! We just launched a new, interactive Parts, Accessories and Riding Gear store making it easier than ever to shop for your favorite Sea-Doo items. Are you looking for a new PFD? 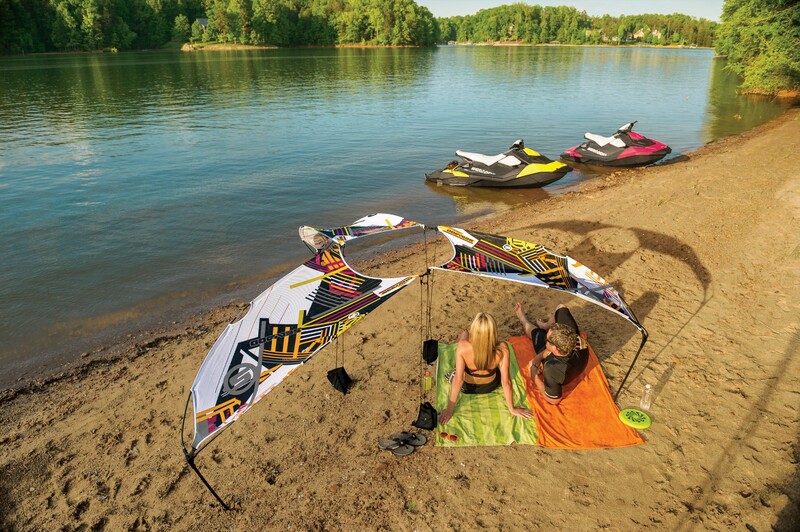 Or an umbrella (Chill Shade) and Snap-in fenders for your Sea-Doo Spark? Trying to figure out which oil you should use in your Sea-Doo? Quickly and easily navigate through the different sections and new categories of the store to find what you are searching for. And if you want to scan through the complete 2014 lineup, you can access the Sea-Doo Parts, Accessories and Riding Gear digital catalog. It is fully interactive! You can watch videos, access various social media networks and zoom in on products as you flip through the pages. The table of contents is accessible from any page and 100% interactive as you can click on any category to get to the desired page. And guess what, when you share a page of the catalogue on Facebook, your friends can turn pages in their newsfeed. Within the Sea-Doo online store, we have added some interesting facts about our products, videos, tips and suggested off-season and in-season maintenance products to ensure you maintain the level of fun. See it for yourself. 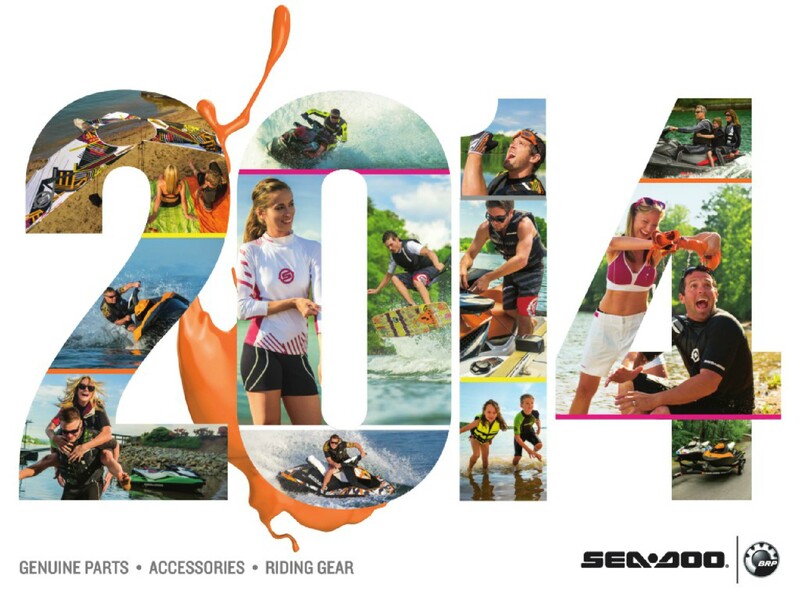 Come discover the 2014 Sea-Doo parts, accessories and riding gear at store.sea-doo.com. BRP’s Sea-Doo X-TEAM racers are preparing to follow the most successful World Finals efforts in the history of the IJSBA World Finals with on boxing new 2014 Sea-Doo RXP-X 260 watercraft. BRP continues to lead the industry in racing support with the Sea-Doo X-TEAM Bounty racer contingency program and Sea-Doo X-TEAM race promoter support program ensuring racers have events to compete. Following a dominating 2013 season world-wide, the long list of who’s-who of racing champions is looking forward to challenging for 2014 titles aboard the most popular performance watercraft on the market, the Sea-Doo RXP-X. The 2014 season has already started off strong for Sea-Doo X-TEAM riders James Bushell and James Masterton have already collected prestigious wins. 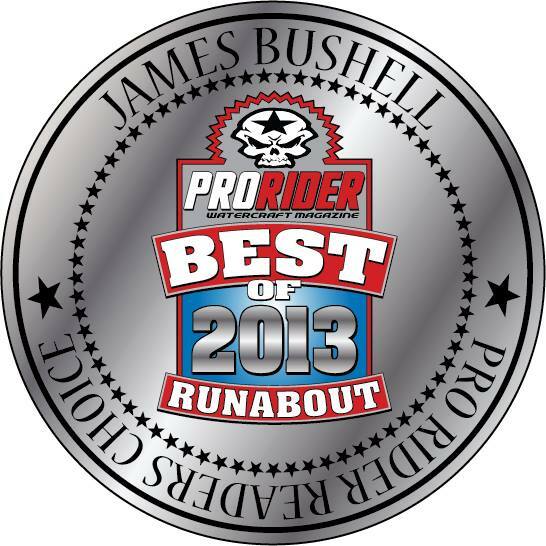 Bushell collect his third consecutive double-double world championship effort aboard his 158/performance/Sea-Doo Centre backed RXP-X and for that was voted Pro Rider Magazine’s Best Runabout Racer of the Year. The popular UK rider is poised to again challenge for the most prestigious championships around the world. 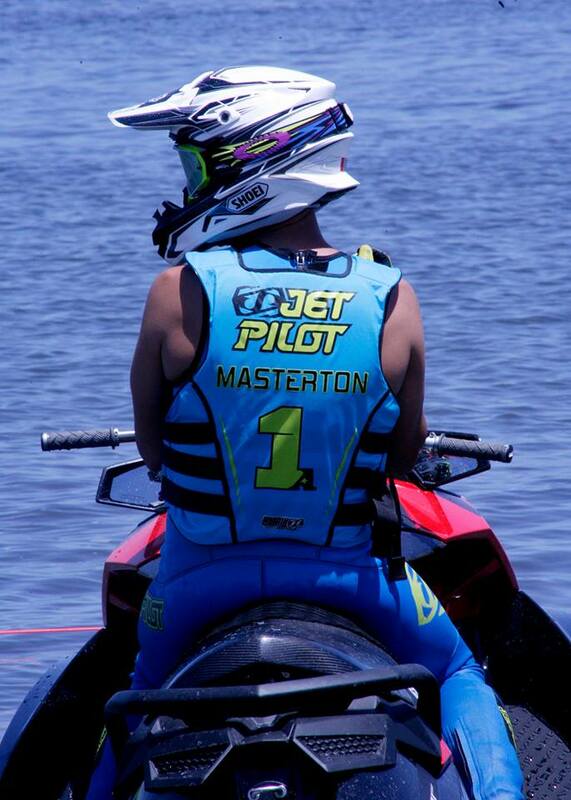 Masterton rode his Sydney Sea-Doo Performance RXP-X to his second consecutive King of the River race in Australia this past weekend and is putting together a championship bound effort for 2014. The two James join current Pro Open World Champion, Jared Moore in efforts to keep the podium Sea-Doo rider filled along with a long list of Sea-Doo RXP-X mounted riders around the world. When the world wants to win, the world rides Sea-Doo watercraft. All of these riders will have an almost unfair advantage by riding the new Sea-Doo RXP-X watercraft. The 2014 Sea-Doo RXP-X 260 model is the ideal watercraft for closed course racers and performance enthusiasts. It continues to build its performance legacy with a new Viper Red color, ominous visual appeal, ingenious hull design and ergonomics that allow riders to realize 100% of their riding potential. The T3 hull design allows the RXP-X 260 model to aggressively lean into corners and penetrate chop better than any of its two-seater counterparts. T3 stands for “tight-turning t-hull” and uses an advanced, dual surface hull design with a unique combination of soft and hard chines, dual axis adjustable rear sponsons and performance trim tabs. This allows the rider to lean further into corners, turning tighter and faster, leaving the competition’s two-seaters in its wake. The revolutionary Ergolock system integrates a narrowing, body-molded racing seat, Adjustable Ergonomic Steering (A.E.S.) system and angled footwell wedges, all complementing the lean-in characteristics. With the A.E.S. system, the rider can adjust the handlebar width and grip angle for a perfect upper body connection. The unique RXP-X 260 seat form-fits the rider’s legs, alleviating upper body strain in hard turns, using the leg muscles to lock the rider into the machine, and ultimately the water, better than any other two-seater. BRP’s Intelligent Brake and Reverse (iBR) and Intelligent Throttle Control (iTC) systems complete the picture and make the 2014 RXP-X 260 the most feature- and technology-rich two-seater in high-performance watercraft history. The 2014 Sea-Doo X-TEAM Bounty racer contingency program will be announced in the coming weeks with bigger payouts and bonuses.